- How important is self-confidence? You'll quickly see that self confidence is arguably the number one factor in your development. While it isn't the ONLY factor, it's the one that can make the biggest difference. The real question is: How does it make a difference? - Can you identify and deal with your shortcomings? No one is perfect, nor are they expected to be. That doesn't mean you shouldn't strive for perfection. In order to do so, you'll need to be able to identify your problem areas, and understand how best to address them. - Commitment, consistency and consolidation...the three "C's". These three things can make or break your development. While it seems pretty simple, you might be surprised at just what each of them requires from you in order to work together as a whole. The good: You will find plenty of interesting advice, lots of things that can make you stop and think about yourself, your personality, and your actions. Plus, this product is totally ready to be re-sold, since it consists of the license, the images, and the sales letter (no PDF file in this one). The downside: The writing is not that perfect. It's not bad, nor is it ESL, but it's not the most well-crafted e-book. Thankfully, with the rights included, you can tweak it a bit to make it sound better. Still, it's quite readable though, and as I said, you will learn quite a lot from this. The length of the e-book is acceptable and won't eat up a lot of your time. All in all, this package will be a pretty nice product to offer your readers and customers and is definitely something you yourself can easily benefit from. 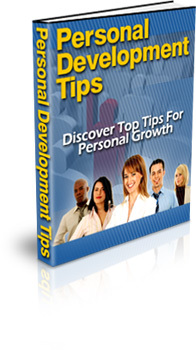 Most of the information here is basic and can already be found in other self-help or self-development books, but this is still worth a read, even if only to remind yourself of the classic self-development principles. There are also some fairly new concepts like self-hypnosis which is well worth a try. Also, while there are practical exercises here, the writing is mostly theoretical. I was looking for case studies of successful people as these make self-help books more compelling.